Summary: The light strip is great, and I love it, it can be used in lots of different ways in the home, some more simple such as a simple light above our below your kitchen units, or something a little more creative in your office or behind your TV. 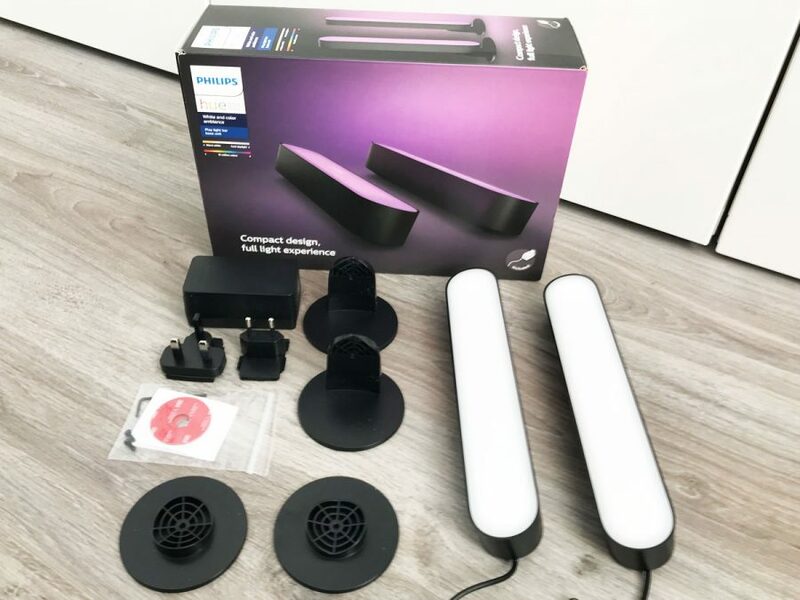 This isn’t a bulb but a lightship can be used for many things in the home, from lighting up cabinets, or lighting up behind the TV, combining this with the Hue system you can add a new dimension to your set up at home. 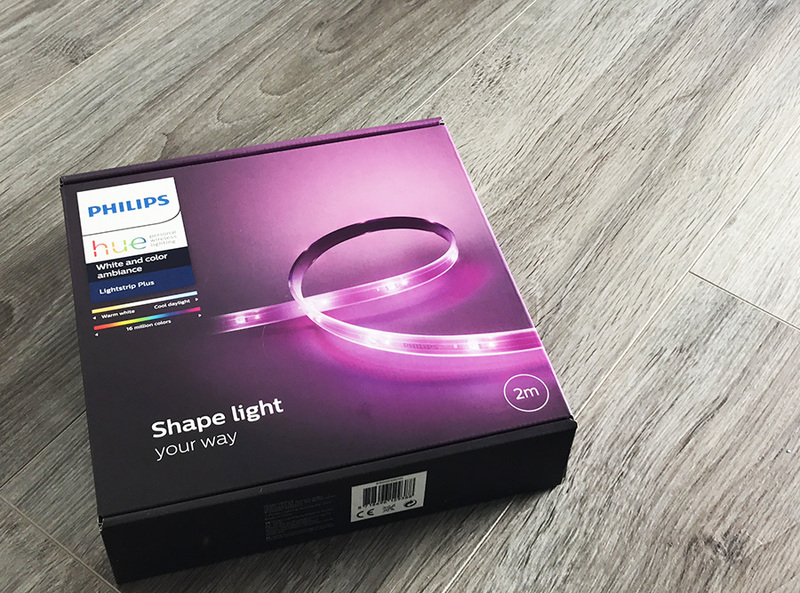 We review the Philips Hue Lightstrip Plus, what it does, what it can do and seeing how good it really is. In the box you get a 2m light strip, mains plug socket with a US and UK adaptor which just slides onto the mains plug socket, and then the controller box which has a cable that connects to the mains power socket plug, and a socket on it for the light strip to connect into. Setting the light strip is a breeze, physically connecting up the parts is straight forward and no need to read the instructions really, it all just connects up simply enough. The cable from the plug to the controller is quite long and then from the controller you have your 2m light strip. 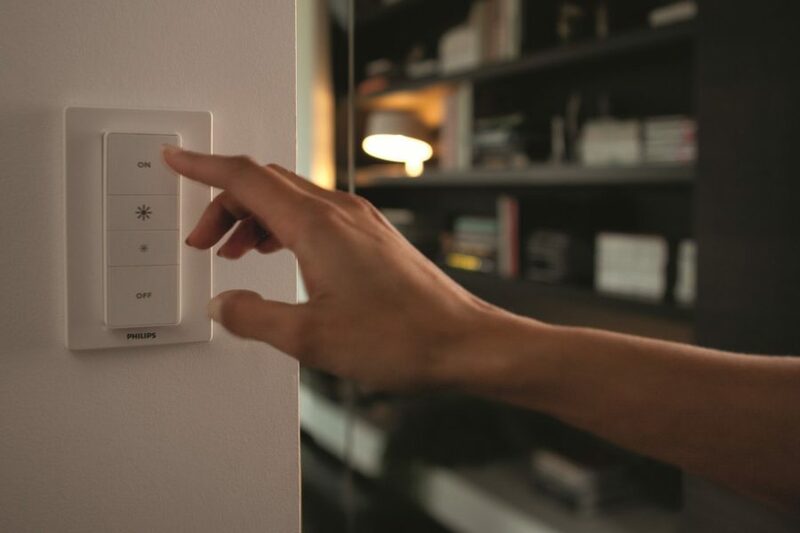 Once all set up and plug in, you can then add it to your light set up using the Philips Hue app just like you would with any other Hue Bulb. 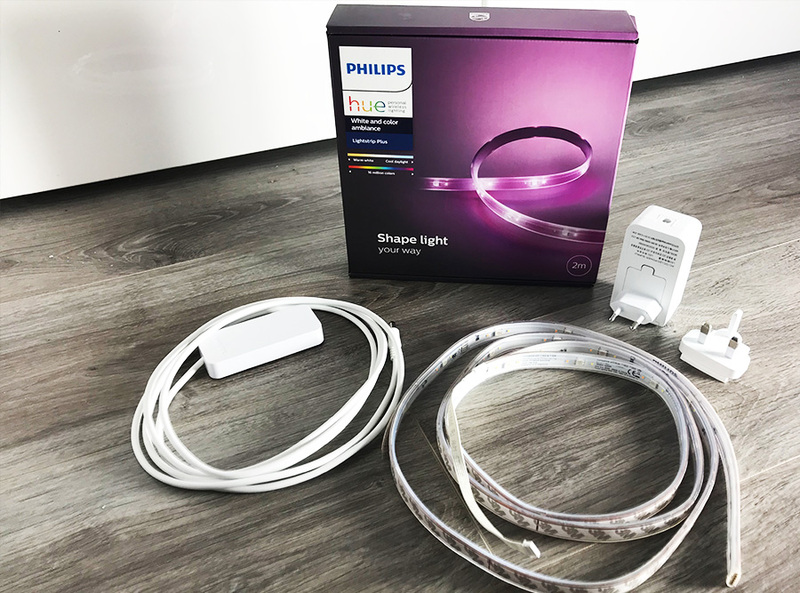 The hue light strip comes as a 2m length, however you can extend this by buying the light strip 1m extensions, and go up to 10m in length, you can also go the other way and reduce the strip by cutting it to make it smaller too. 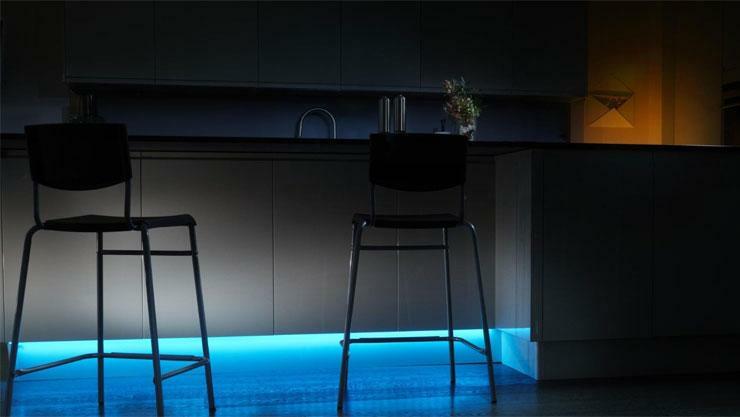 The Hue lightstrip can be reduced in length from its 2 metre size by cutting it where it is marked along the strip. There are sections where it can be cut, you cannot cut anywhere you like, below shows the marking where you can cut the strip. If you cut it anywhere else the section before it may not work, so it is important to only cut where the scissor markings are. The big downside with cutting the light strip is that the section that is cut off becomes waste and cannot be used again. If you buy a light strip which is 2m long, however you only need it to be a metre, the metre you cut off then becomes waste making it an expensive light strip. There is currently no way to reuse this section and it would be great if this is address in the future by Philips. If you wish to extend your strip longer than the 2 metres then you can be 1m extensions that just connect to the light strip, at the end of it is a pin connecter where the next one can be simply attached. This is great for longer runs and creating a great light effect long walls or on top of kitchen cabinets. You can see the lightship being set up and in action in this video below. 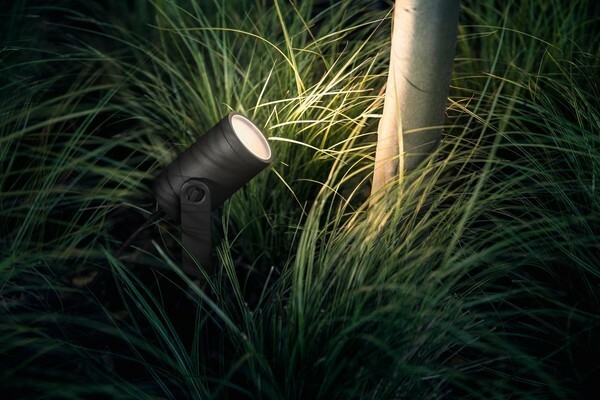 There are many ways you can use these lights that you may not have through about, here I have rounded up a little list of some great ways they could be used, some are more creative and decorative while some are great practical ways to use them in the home. Run them down your stairs, great as a safe nightlight. The light strip is great, and I love it, it can be used in lots of different ways in the home, some more simple than others, such as a simple light above our below your kitchen units, or something a little more creative in your office or behind your TV. The strip can be easily extended with 1m add ons making it ideal for longer runs and more flexibility for how you may wish to use it. While it works well it is shame that although you can cut the strip, if you don’t require a 2m length, that then becomes waste, it would be great if this could be re-used in an official way unless you solder it yourself. With future updates it would also be great if the strip was made thinner making it easier to bend around corners and giving it some more flexibility. So overall there are things that could be better but it is still a great addition to any Hue set up, be it behind the TV, a run behind your furniture, on the stairs of around your head board there are many places and way to use it. The lights works well and the effect it gives off is great. 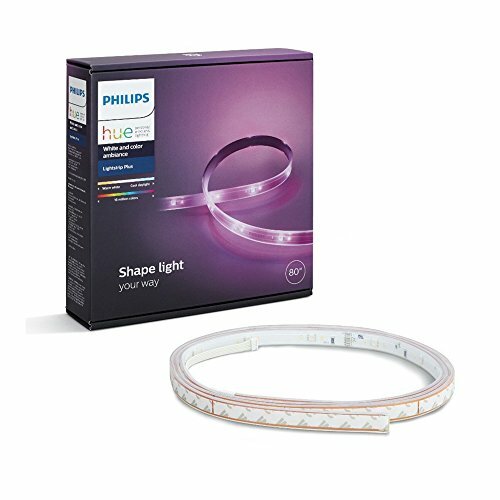 Is it possible to connect 2 Hue Lightstrips instead of buying multiple extension packs? The new lightstrips have a fixed connector to the end, the extension cables have a connector that pushes into the 2m lightstrip, therefore it isn’t possible to extend by using the 2m light strips without some delicate wiring and soldering which isn’t really worth it. I can’t add or control Philips Hue LED lightstrips to my Google Home. It shows up on my Philips Hue app but not the Google Home. 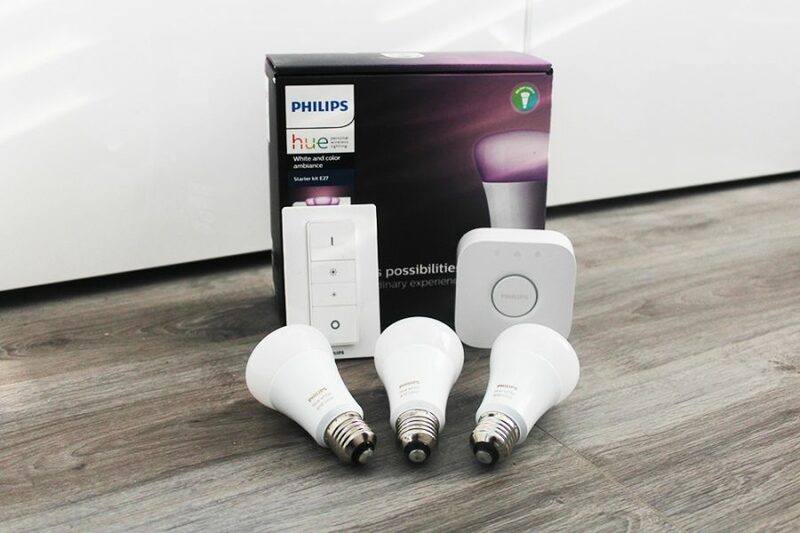 I have already linked the Philips Hue account under devices as well. Where can I buy the hue strip lights with the detachable controller, where I can extend the driver? 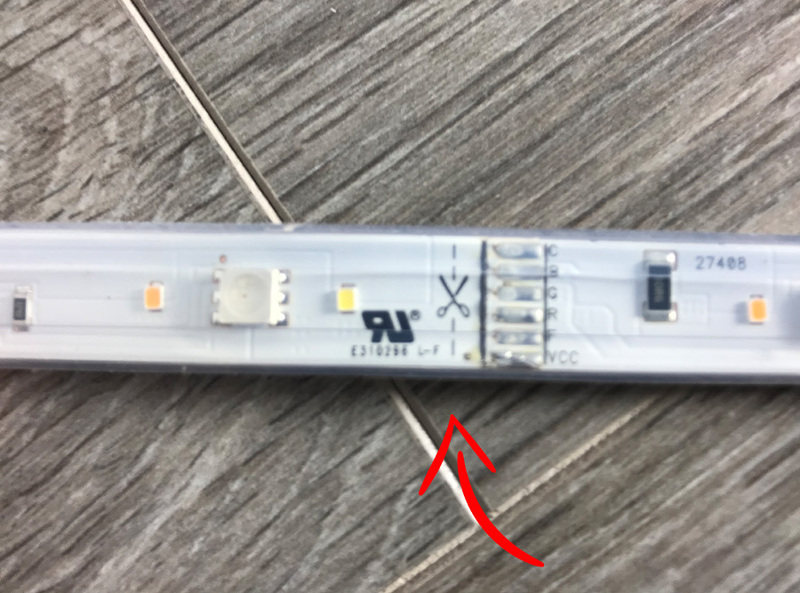 How long is the distance from the plug to the start of the light strip? If i want to install on the top cabinets and along the floor, does that mean i have to buy 2 units that operate separately? i.e the ones on the floor level will give different colour to the ones on the top of the counters? ideally i would like to have a single unit but if your kits are only 2 meters how does one install without wasting a part of the strip that is just to link the top shelf to the floor plinth? You could uses two separate strips, assign them both a room, kitchen, when you change the color of the kitchen both strips will change to that color. You can also change one to one color and the other to another. You can use litaccesory if you want to do it as one run, it really depends on the design and room to run the cable/lightstrip.